www.travelindustrytoday.com July 12, 2007: Steve Gillick is a voracious traveller. He is happiest when on the road. Attending one of his seminars, or sitting beside him at events, is always a pleasure, because his knowledge and enthusiasm make his work a vocation – and yes – perhaps, a vacation. Steve’s views on the “new” wonders of the world are, as usual, thoughtful and provoking. This past week news services around the world picked up the announcement that the “New Seven Wonders of the World” had been determined. Or perhaps, more accurately, it is a fast food world we live in. Instant gratification. Consumer opinion polls for just about everything. American - then Canadian Idol - and now World Attraction Idol. Voting for your favourites, as if it were a beauty contest. There are winners and runners up. There are honourable mentions. There are losers. I can say that I saw 6 of the 7 “new wonders”, before they were wonders. To me each one was an adventure in witnessing history; travelling to exotic places; learning about new cultures; sharing in the spirit of discovery; marvelling at what past generations had conceived; understanding the reasons why a landmark existed and understanding the people who built that wonder. 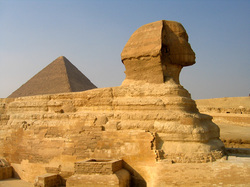 When I visited these heritage sites, I did so out of a sense of respect and yes, wonderment. The recent beauty contest of world heritage sites demeans the very sites that should be admired and honoured. In the ancient world, the figure of ’10,000’ was applied to distance, to connote an unbelievably long journey that would take perhaps a lifetime to complete. Today a trip to Asia from Canada will cover that distance in 12-14 hours. Our sense of wonder and journey and discovery has changed with the times. The ancients were fascinated with the beauty and complexity and mystical quality of wonders such as the Hanging Gardens of Babylon, the Temple of Artemis at Ephesus and the Great Pyramid of Giza. Times have certainly changed when riveted metal structures such as the Eiffel Tower and the Statue of Liberty are listed as “finalists” in a 7 Wonders pageant. The contest organizers claim to have received 90 -100 million votes, but surely most of these are unquantifiable in terms of personal background, travel experience, literacy, duplicate voting. And one need only to go to the 7 wonders website to test this out. There, under the Great Wall of China, is a picture of some people holding a banner at Bedaling, asking contest participants to vote for this site. Bedaling is as artificial as they come. It is a tourist attraction, befitting an amusement park. Aside from the steep climb from watchtower to watchtower, it is a clean, sanitized attraction to give tourists the opportunity to challenge themselves by walking up a steep incline, perspire, huff and puff, take a photo and claim that they have climbed the Great Wall of China. They know that the Wall was built to keep out ‘invaders’, but that is it. Very few dare to venture to a place called Simatai (or similar places) where, at least when I was there in 2000, the wall was in its natural state: In disrepair, steep crumbling steps, natural surroundings (and only a few T-shirt sellers). So which Wall did the voters vote for? The nice clean version - or the rugged natural version? What happens when tourism strikes? Will tourists now start to flock to these new Wonder destinations? Perhaps. The Baby Boomers and Generation X’s are looking for adventures that include going off the beaten track. They crave more spiritual experiences and more educational adventures. They are already (with families in tow) visiting Machu Picchu and Angkor Wat and the Great Pyramid. Much has been written about the effects of tourism on these sites and others, and yes, it is up to local authorities to stop pandering to the almighty dollar and to the inconveniences that tourists must endure, and start imposing regulations that will restrict visitors and safeguard the very wonders that they want to use to attract tourists. It is a vicious cycle but it is up to each country to keep their Wonders, wonderful. What about the runners-up and also-rans? And what about the Wonders that were runners-up in this pageant, or the ones did not receive enough votes to even qualify? Do they fall by the wayside or do they get a second kick at the can in 5 years when the 7 Wonders organization needs a cash infusion and holds a second contest? Will Wonders never cease? While the 7 Wonders may be in fact wonderful to visit, there are a whole slew of unknown wonders that adventure travellers have known about for years. Small wonders hidden in a cave in Laos, or atop a mountain in Sri Lanka, or in a monastery in Mongolia, or in the hills of the Philippines, and more, much more. Let’s not bow to the latest trend to reduce the awesome pleasure of travel and discovery to front an off-beat, misguided commercial enterprise. Lastly, judge the suitability of travel to certain countries and landmarks by the way that country shows respect to it’s own local cultures and customs, how they treat the people displaced by tourists visiting their Wonders. Pay attention to how they educate travellers about their actions and how they safeguard these precious legacies of times past. It is a wonder-ful world out there. Confucius extolled his followers to ‘read 10,000 books ….travel 10,000 miles’. If we all did it in that order, then we would not need contests. Now how wonderful would that be?